If you’ve got an aggressive / lousy boss right now you have my sympathy. Truly. It can really siphon the enjoyment from what might otherwise be a rewarding role, leave you feeling undervalued, and wondering whether you should begin searching for something new. But before you start planning an exit strategy, it would be wise to rethink how you can better manage the boss you already have –for all their flaws and shortcomings. Having worked with numerous not-so-inspiring bosses in my corporate career, I’ve learned they provide invaluable opportunities for developing executive leadership skills and learning ‘what not to do’ when managing people who work for you. You just have to be proactive in looking for them and ready to practice some real self-leadership. However fixed in their ways your boss may be, you can always learn ways to better manage him or her. The secret is to “manage up” without them ever realizing you are doing it. So rather than think of your boss as your boss, think of them as a difficult client – one you have to figure out how to work with if you want to get ahead, even if you’d rather not. Hopefully the strategies below will help you on your way. Underpinning each of them is a commitment to take responsibility for your own success, regardless of the different (and difficult) personalities you will inevitably have to encounter throughout your working life. 1. Know their ‘Why’: Identify prime motivations. The better you understand what your boss does, and more importantly, why, the better positioned you are to deliver results, manage expectations, and avoid lose:lose situations. Try to put yourself in their shoes and see the world, and your workplace, as they might. What would he love more of and what would he love less of on a daily basis? How much importance does he place on impressing others? How does he measure success and what does he think about failure? When you know what drives your boss (even if your boss may not be fully conscious of it), you can speak to “his listening,” frame your opinions and use language in ways that line up with his core values, concerns and priorities. 2. Support their success: Work around their weaknesses. While it may sound counter intuitive to support a bad boss in becoming more successful, there is absolutely nothing to be gained by making him look bad, going to war or facilitating his (or her) failure. If he is as bad as you think, he will likely do a pretty good job of that all by himself. Exposing his incompetence will only compound your own misery and may even damage your reputation. By doing what you can to help your boss succeed, you lay a solid foundation for greater success yourself. It may not be an immediate reward, but in the long run, you can never lose by helping others do better than they otherwise would. 3. Take the high road: Your “Personal Brand” is riding on it. Never let your boss’s bad behavior be an excuse for your own. All too often, people start feeling entitled to slack off, take longer and longer lunches, lose interest or stop performing well because of their bad boss. Don’t do it. Keep your mind focused on top performance. Complain to your spouse or your friends all you want, but when in the office or workplace, stay upbeat and engaged. Actually handling a difficult boss well can really set you apart. You never know who is watching or listening but be assured, people who can open or close future opportunities for you are doing just that! While it may be easy to succumb to resentment or resignation and mentally check out of your job, doing so not only undermines your own integrity but it can put you at risk of being branded as whiner, a slacker, or both. So if your boss is a shouter, don’t react by shouting back. If they are petty or small minded, don’t descend to smallness yourself (however tempting!) 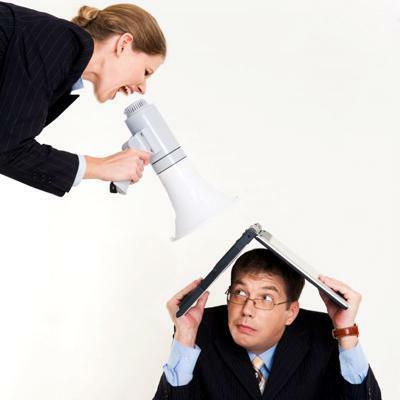 Rather maintain a calm and professional demeanour in dealing with your difficult boss. As Gandhi wrote “Be the change you want to see in the world.” In this case, act like the leader you wish your boss was. If you feel you’ve run out of options for dealing with him reasonably, then don’t go rumor-mongering or bad-mouthing him to everyone within earshot. That will ultimately say more about you than it does about your boss (and not things you’d want said!) Rather, follow proper procedures for registering complaints with Human Resources or with higher-level superiors, documenting each step of the way. 4. Speak up: Give your boss a chance to respond. Early into my career, I left a good job with a global consulting firm because I had a lousy boss and a toxic work environment. Upon leaving, the HR lead – a senior partner at this organization – asked to meet with me to find out why I was leaving. I shared how undervalued I had felt, how the promises made to me upon employment had not been met and how little accountability there was for my colleagues. He was surprised and disturbed and asked if there was anything he could do to make me change my mind. Apparently I’d been ear-marked a hi-po (which would have been nice to have known before then! ), but by this point it was too late. I’d already made other plans, hoping for a better work environment, and a better boss. The lesson for me was this: h ave the courage to speak up rather than cower in silence for fear of an awkward conversation . The truth is that I’d been too cowardly to address my concerns with my boss or to go around her. Admittedly I was young (mid-twenties) and inexperienced, but if I knew then what I do now, it would have been that I owed it to myself, and to my boss at the time, to have at least voiced my concerns, offered up some possible solutions and engaged in a conversation about how we could have improved the situation. It may not have changed a thing, but at least I could have known that I at least gave her a chance. So just because it may be easier to say nothing, to just ‘suffer quietly’ or complain loudly to colleagues or to head for the exit as I ultimately did, you at least owe your boss the opportunity to respond. Don’t prejudge and assume they aren’t able to take feedback, or don’t care how miserable you are. When you approach them with respect and with a genuine desire to make things work better, you can open the door to whole new levels of trust, collaboration and outcomes. A door that will remain permanently closed otherwise. 5. Know their preferences: Adapt to them. Observe your boss’s behavioral style, preferences and pet peeves. Is he fast-paced and quick to make decisions? Is he slow to think about things, needing time to process information? How does he like to communicate – via e-mail, in person drop-ins, or lengthy memos? The more you can match your style to your boss’s style when communicating, the more he will really hear what you’re saying. If you’ve ever done any personality assessments such as Myers-Briggs or DISC, then see if your boss has as well and find out what they are. It can help you adapt your style and spare a lot of strain. Working with his preferences is an obvious way of managing your boss without his ever knowing it, and it’s a key leadership skill to develop regardless of the kind of boss you are working for. 6. Don’t be intimidated by a bully: Stand tall, never cower! People who bully get their power from those who respond by cowering and showing fear . If your boss is a yeller, a criticizer, or a judge – stand firm. If you’re doing the best job you can do, keep your head held high and don’t give him the satisfaction of pushing you about. Rather ask questions, seek to understand, and work to defuse a difficult situation instead of cowering or responding in anger. It takes practice, but over time you will get better at it and he will look elsewhere for his power kick. 7. Be Proactive: Do your research before jumping ship. Of course the best way to manage a bad boss is not to have one in the first place. So whenever you are looking to move into a new role in the same company or move to another organization all together, invest some time to get a sense of the culture, the leadership and the sort of management practices that are tolerated and supported. If you are moving internally, make sure you do your networking ahead of time to get a sense of both the environment within the team you might be moving to, and those who are creating it. Are they leaders who create an environment where people are inspired and supported to work hard, or do they incite fear about what will happen if people don’t? If you are moving to a new organization, do your research to make sure you’re not jumping from the frying pan into the fire. Sometimes in our desperation to escape a toxic work environment we fail to take notice of the warning signs that the new job we’re taking will only be worse. Have a coffee with whoever you know at the new company to get a sense of the culture, employee engagement, moral, and management style. Investing a few hours up front could spare you a few years of frustration.